England coach Roy Hodgson said he was impressed by his team's patient approach in breaking down San Marino at Wembley in their Euro 2016 qualifier. The home side scored twice in the first half on the way to a 5-0 win against the world's joint lowest-ranked side. 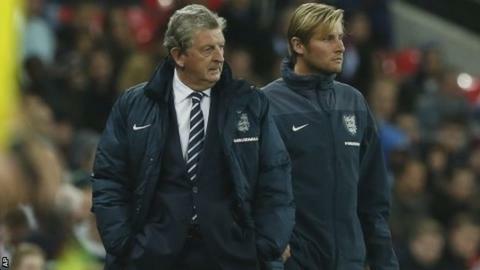 "We worked hard to break down a stubborn team," Hodgson told BBC Radio 5 live. "The longer the game went on we knew it would open up and we'd get more chances, and that's what happened." Everton defender Phil Jagielka headed England into the lead, before captain Wayne Rooney grabbed his 42nd international goal - a penalty, after San Marino's Andy Selva struck his face with his boot. England managed 12 efforts on goal in the first half, and 22 after the break as they picked up the tempo while their opponents tired. Further goals came from Danny Welbeck, substitute Andros Townsend and an own goal by Alessandro Della Valle when he deflected Rooney's cross into his own net. Victory took England top of Group E on goal difference ahead of Lithuania, with both teams on six points after winning their opening two games. "In the second half our passing tempo was a bit quicker, but once you go 2-0 up and 3-0 up it gets harder for them to keep going," added Hodgson. "What also impressed me was the players' desire to work hard to get the ball back. If they can develop those skills then it would stand them in good stead going forward." San Marino coach Pierangelo Manzaroli said he was impressed by his side's display, especially in the first half. "The experience and pleasure of playing in such a fantastic stadium against a lot of fans was great," he said. "Against teams of this stature, sometimes the results are worse. So we take that away. The first half was a great performance from us and, had we been a bit more careful, we might not even have conceded those goals." Almost 56,000 turned up at Wembley Stadium - 15,000 more than watched the national side in a friendly against Norway in September. "The support here was the highest around Europe," said skipper Rooney. "It shows what a great nation we are. The support we have from the fans is amazing really. On behalf of the team I would like to thank them for coming out tonight."